Yeah, yeah: you want to lose five pounds, exercise more, eat less. Who doesn't, at least during the first week of January? But wellness means more than numbers on a scale, and a few local initiatives are playing their part in crafting a healthier Grand Rapids. Each week this month, Rapid Growth will feature one unique way to be well in West Michigan. Want a more thoughtful, sustainable path to feeling better in 2015? Read on. Say the word "yoga" in January and it conjures visions of pricey, exclusive studios packed with newly resolved, well-intentioned yogis seeking to shed some excess holiday pounds. But EmbodyGR, a radically inclusive yoga community with a social justice focus, is looking to change that stereotype – and to open up yoga to a whole new community. Dana Christian Lee is the force behind the group, which has been meeting each Wednesday evening at the Fountain Street Church social hall, and she's a woman on a mission, though not in the traditional religious sense. "I just know way too many people who want to be involved in yoga and feel like they aren't skinny or rich enough to fit in," says Lee, who is also a traditional yoga instructor at several studios in town. "So I started a community making it free, welcoming everyone just as they are." And when Lee says everyone, she really means everyone. "You don't have to believe anything, look a certain way . . . we have CEOs and homeless people. That's the whole gig: gather the most unlikely bunch of people around a practice that we've narrowed too intensely in the west." Regular attendees include everyone from single men in recovery to Heartside business owners, from nonprofit executives to families with teenagers. Lee says the practice has been transformative for many, sharing stories of members who have quit smoking, lost weight, shed anger, engaged in new community work, strengthened marriages, and forged new friendships. The mission of EmbodyGR, whose nonprofit status is pending, is "feel better, do good." Lee is slowly building a relationship-based, service-oriented community around the practice, and she's working hard to erase every possible barrier to joining. The group provides free childcare, mats, water, and hot tea – and offers reduced-cost ramp parking and is located on the bus line as well. "It's urban, accessible, and we're using the space for free, using already-existing community resources," Lee says, noting that Fountain Street generously donates its space without expectation. "When I created this model, I wanted it to be an enhancement to the entire city, not just individual people or one or two organizations. So it's not just about getting physically better; it's a connection to something larger than themselves." To that end, EmbodyGR hosts occasional community potlucks and local musicians like Jeremy Arndt as part of the practice. The group also welcomes a monthly guest speaker who educates the group on a featured organization, like Degage Ministries, Project Red, Well House, or another local nonprofit. Then Lee encourages the group, often as many as 60 people ranging in age from teenagers to octogenarians, to find a way to give back to the community, whether it be by walking in the AIDS walk or making blankets for Project Linus. 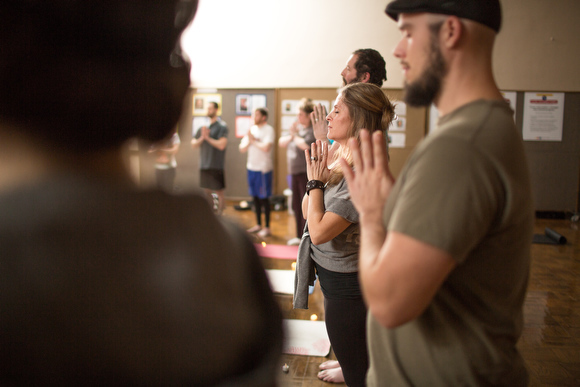 In a culture where yoga typically creates an inward focus, Lee's goal is to turn the peace and strength that comes from regular yoga practice outward to enhance the community. "This work isn't because I'm so privileged," she says. "It's because I've witnessed injustices and I have to change them. Many single-income, full-time yoga teachers are part of the working poor. When I got divorced, I didn't have money for yoga or for yoga clothes. So I used my frustration to create a system that had equity. I wanted people to feel validated, to feel seen and valuable no matter what their income or housing status. I know so many people who at the end of the day don't have anything to fill them up." How does Lee fill herself up to stand on her hands most days of the week? "Eat, sleep, love your family, good food, all that kind of stuff," she says. "Truckloads of coffee, if I'm being honest." 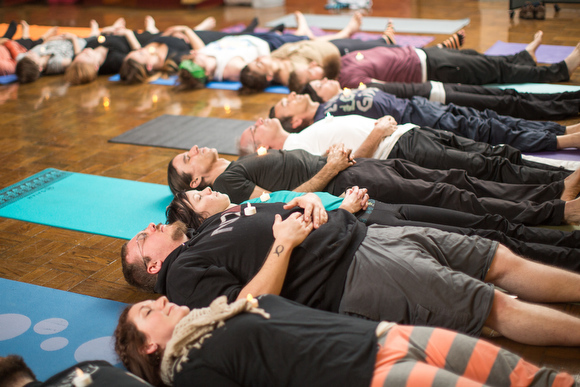 She hopes attendees will not only find themselves feeling better physically but will also find themselves a part of a more connected, compassionate community. EmbodyGR often offers time at the beginning of the weekly practice for people to share something good or something tough happening in their life. "It's a very sacred and safe space," says Lee, "with no religious component. But it is such a powerful practice that it's like church to me: gathering people to heal and connect, no matter what you believe." And it's this kind of welcoming, inclusive community that keeps drawing people back to the yoga mats each week at the not-a-church within a church at Fountain Street.